Mike Dickison (formerly at Duke University, now at the University of Canterbury in New Zealand) studies the evolution and allometry of flightless birds. Here, he presents his results from a side study on a giant flightless bird native to New York City. Here's a fascinating story on NPR's Web site (I found it courtesy of Joseph Hertzlinger, who in turn found it via BoingBoing -- who probably got a tip about it from someone else). It's about a neuroscientist named James Fallon, who was studying that standby of Frankenstein movies, the criminal brain. Fallon identified certain anatomical features which turn up in the brains of psychopaths. Then he looked at his own PET scan. And found . . . the same feature. Now, Dr. Fallon isn't a psychopath (or is really good at hiding bodies), and he attributes this to having a good upbringing. The psychopaths who actually do go around killing people tend to have bad childhoods. Except when they don't. Jeffrey Dahmer had a normal, upper-middle-class upbringing, for instance. And there are presumably large numbers of people with "psychopathic" brains and bum families who aren't killing anyone. Dr. Fallon appears to have discovered free will. The folks who brought you GalaxyZoo have launched a brand-new citizen science project, focusing on a celestial object that’s much closer at hand – the moon. For the past year, NASA’s Lunar Reconnaissance Orbiter has sent us remarkably detailed images of the lunar surface. MoonZoo asks volunteers to scan through these images and count craters. Why? Because astronomers are drowning in raw data and need help to turn it into a dataset they can analyze. Why count craters? There’s no wind or water erosion on the moon, so the number of craters visible on its surface is a good measure of its age. What’s more, whenever you spot a crater that has boulders around its rim, you’re seeing the remnant of an impact so powerful that it blasted chunks of bedrock up through the regolith – the dusty materials that cover the moon’s surface. The MoonZoo astronomers hope that finding these craters will help them create a map of regolith depths. Interested? Sign up and get counting! A band of plucky pre-teens have discovered a cave! No, this one doesn't contain pirate treasure or crooks masquerading as frog monsters -- but it is on another planet. A group of middle-schoolers in California doing a science project about Martian geology noticed a mysterious dark spot on NASA orbiter images of the planet Mars. It looks very much like a "skylight" opening into a lava tube near the giant shield volcano Pavonis Mons. 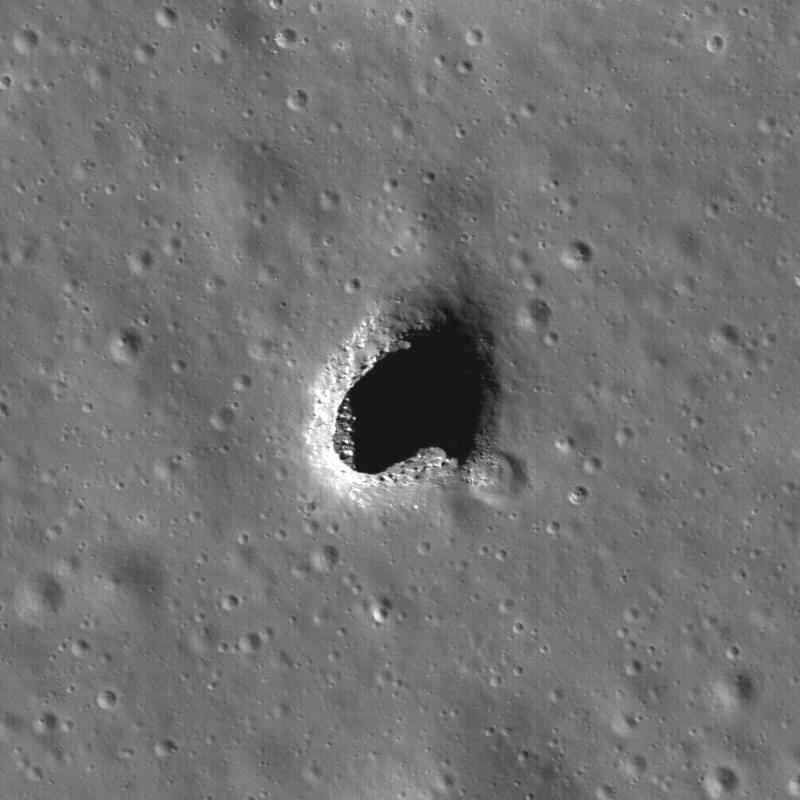 Couple that with the astonishing image of a cave on the Moon, and this has been a good week for space speleology. There's a vast collection of plastic garbage in the North Atlantic Ocean. The Sea Education Association (SEA) has been monitoring it for nearly 25 years -- and this year, with funding from the National Fish and Wildlife Foundation, NOAA, the American Chemistry Council, and the Henry L. and Grace Doherty Foundation, they're sampling what they believe is a southern branch of the garbage field. The expedition's been sailing for a week and continues until July 14. Their website includes posts about life aboard ship and a daily science results update. The mighty PhysOrg site has an entry up about a paper in PLoS analyzing the evolution of specialization in cells. If you feel up to it, read the full paper here. Sergey Gavrilets at the University of Tennessee at Knoxville did a million-generation computer simulation to study how cells might become specialized in multicellular organisms, even if the specific cells "want" to maximize their own success. ("Want" is in scare quotes because, of course, cells don't consciously desire anything, but in this context it's a useful shorthand expression.) In other words, how do cells -- which are mindless -- nevertheless "decide" to cooperate and rely on each other? Apparently it took a relatively short time -- a million generations, but for cells a "generation" can be a matter of hours -- for the cells to evolve specialized functions within a larger colony. The cells (and remember, these are very simplified mathematical simulations, not real organisms) which form colonies and do their part for its survival ultimately have more daughter cells than the ones which cheat and maximize their own survival. In short, ethics is a winning evolutionary strategy even at the cellular level. And Adam Smith's division of labor is also more efficient at the cellular level than a war of all against all. At least, that's what the math suggests. Just got back from a long car trip, so here's a quick link to some amazing photos of sea life. Tip of the diving helmet to David Thompson's blog. Bubbles are fun. Drinks with bubbles in them are refreshing. Bubbles are fun to play with. And now scientists at Harvard's school of engineering have been using super-high-speed video to study how bubbles pop. It turns out it isn't as simple as you might think -- the bursting bubble often creates a circle of "daughter" bubbles. Here's the link, at PhysOrg; scroll down to the second embedded video. It isn't quite as mind-boggling as Harold Edgerton's strobe films, but for Harvard it's not bad. Saturn's moon Titan has long been a strong contender as a place to look for life beyond Earth. It is extremely cold (daytime highs in the 90s -- that's degrees Kelvin, of course; about -180 Centigrade) but it has a dense atmosphere and the Cassini probe confirmed the existence of methane lakes on the surface. It's very rich in complicated organic molecules, the sort which on Earth are intimately involved with living things as precursors or products. Just recently Cassini found something much more interesting about Titan. Its atmosphere is missing some things. Specifically, the amount of hydrogen at the surface is lower than elsewhere, and there isn't any acetylene. This is bad news for welding contractors in the outer Solar System, but it's intriguing to biologists interested in life beyond Earth, because this suggests something is using the hydrogen and acetylene. This certainly bears more looking into. Life on Titan would be very different from life on Earth, and would be unlikely to share any common source. Instead of DNA it might encode its genetic information in complex hydrocarbon molecules. Getting a look at an entirely different kind of life would tell us a great deal about how our own kind works. And since there are probably a lot more cold worlds like Titan in the universe than warm water-covered garden spots like Earth, hydrocarbon life might be a lot more common than DNA/water life like us. There's a story on PhysOrg today about an Arizona man who's been fitted with the first portable artificial heart. It's powered by a backpack device, and he's actually going home from the hospital with it pumping away inside his chest. The obvious reaction is to congratulate everyone involved. As a 43-year-old man I want as many medical breakthroughs as possible to happen now, well before I need them to keep me alive. Lately, however, I've been thinking about how science fiction metaphors change when they become real. A mechanical heart, for instance, would be a powerful symbol of dehumanization: a literal "man with no heart." One can easily imagine a character like that as a villain in a 1940s Universal horror movie. Heck, on Doctor Who the villainous Cybermen were implied to be heartless monsters because they replaced their various body parts with machinery. In C.S. Lewis's novel That Hideous Strength, there's a shuddersome passage about the inhabitants of the Moon, creatures horribly tainted by contact with cosmic evil. How bad are they? They no longer reproduce the way Nature intended, but conceive their young artificially in laboratories. When Lewis wrote that in 1945, it was a perfect metaphor for an "unnatural" world created by scientific hubris. Now? In vitro fertilization is a bog-standard medical technique used to help infertile couples all over the world. It's not even a big deal anymore: the kind of thing a kid finds out from Mom and Dad when they're going through the photo album just before the Senior Prom or something. There are thousands of beaming parents holding chubby babies created by in vitro fertilization; some of them probably even call it a miracle. So good luck to Mr. Okeke with his new heart, a "dehumanizing machine" which gives a man some more days with his family.